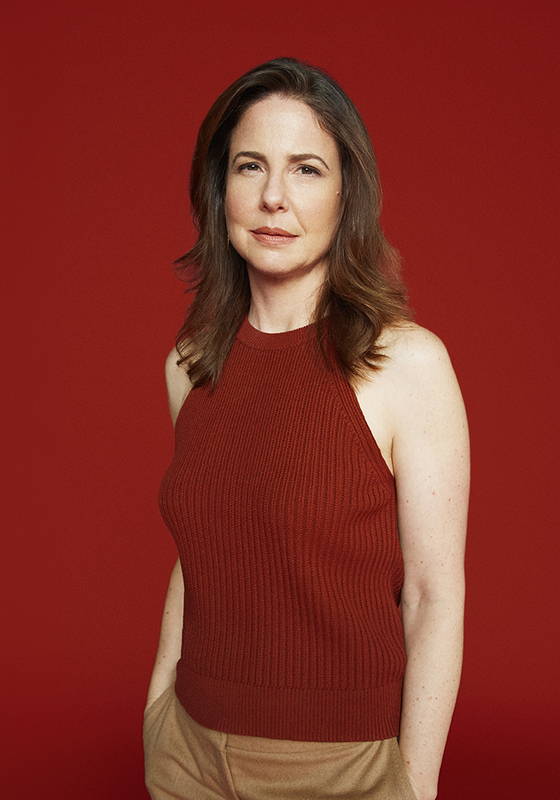 Robin Weigert, who plays Verena Baptist on AMC’s Dietland, talks about Calliope House’s mission and what Verena ultimately wants for Plum. Q: What drew you to Dietland? A: I tested for the part and had the great good fortune of getting to read with Joy [Nash], whose beautiful, truthful read of Plum helped give me a deeper read of my own character. It was a huge advantage, at that stage of the audition process, to be able to work with such a gifted actress and took so much pressure off of needing to “perform” to try to win the part. All I had to do was respond. I came away from the test with my fingers crossed for an offer not only because I loved the material, but because I was utterly taken with the actress who would be my primary scene partner throughout the first season. Q: Verena Baptist is a woman on a mission. What did you think of her cause and the New Baptist Plan? A: Verena is complex enough that I felt the need to sit down at one point and actually type up a psychological profile of the character. I never do that! [Laughs] I just felt, as scenes began to come in mid-season that showed more of Verena’s underbelly, that I needed to do the work of imagining the source of her contradictions, which I located in her extremely chaotic childhood. What we learn about Verena over the course of the season is that, while she appears genuinely magnanimous when the character is introduced, there are conditions for her generosity and when they are not met, she can be vindictive. One minute the character feels expansive and forgiving, the next shut down and controlling. I wouldn’t say the character is mercurial, I would say that she has a threshold and when that threshold is violated, all bets are off. Q: How does Verena’s ideology compare to what we’re seeing of Jennifer’s? A: Well, Verena’s a talker. It would be easy to mistake her approach for therapy. She works hard to bring women out and help them develop an awareness of themselves. Of course this looks a lot like nurture. The fact is, though, that unlike a therapist, she’s doing the compassionate work of listening while harboring a strong agenda of her own. Verena’s ambition is nothing less than to create a complete revolution in thinking in the culture; helping women with the potential to make a cultural impact get in touch with themselves is just a means towards an end for her. As in the real world, though, violent methodology gets more attention. Yes, Verena is against violence in principle, but there is part of her that is also competitive with Jennifer. Their way gets coverage. Their way gets attention. Verena has a genuine antipathy for violence and she fears her work being rendered irrelevant by it. In any movement, there are different ideologies vying for attention and this can create an atmosphere of competition and conflict in spite of the fact that warring members of an oppressed class are often struggling to achieve the same objective. Q: Verena is pretty much going directly against what her mother taught her. How would you say her upbringing has fueled her beliefs today? A: Here’s my vision of Verena’s childhood, drawn partly from the way she describes it to Plum, partly from an intuition I have based upon the character’s behavior. I think that because Mother succumbed to drugs and alcohol, Father, though controlling, became the one Verena relied on for stability because Mother’s inner life became so utterly chaotic. This forced an identification with the dominant parent, who was also her mother’s oppressor. Verena has that of her dad in her. In other words, lurking within her is the potential to be as autocratic as he was. It’s important to point out that, in spite of having written an anti-dieting screed, this is not Verena’s only cause. Yes, she wants to debunk the myth behind the cultural obsession with weight loss, but more important to her is to fight her mother’s deeper battle and win it – the battle to have an identity that was not dictated by her domineering father. Every woman Verena works with is a surrogate both for herself and for her mother. Q: Calliope House receives a bomb threat in Episode 4. Is Verena worried about her own safety or is she willing to risk her life to do this important work? A: This is where I think you’ll start to see some chinks in the armor. As the battle comes closer to home and threatens her private territory, her actions become more defensive. She shuts down around the idea that something could figuratively blow up the world she’s created and expose it and put the people she’s gathered in danger. She’s a little distressed about what’s going on behind the scenes. I think loss of control is existentially threatening to her on a very primitive level. It masks itself very well because she’s able to be very benevolent when things are safe. Q: Episode 4 is all about Plum, with the help of Marlowe, trying to make herself “bangable.” What does Verena hope Plum learns from all of this? A: At the point where they meet each other, all of [Plum’s] anger is imploding. She’s on a very self-destructive course. If through a series of experiences, Plum can give herself permission to be angry at other people and realize there may be less wrong with her and more wrong with the world, then there’s a piece of healing possible. And there’s the side benefit of possibly having another soldier for the cause by the end of it. She’s deliberately taking a woman who is crushed by her own self-loathing and trying to put her through a series of experiences – not just because she wants to make her angry, but because she wants her to have a chance to redirect that energy. Q: What was your biggest takeaway, personally, after working on this show? A: I loved how harmonious things were on set. It was so balanced. Everybody was working together and creatively engaged with the material and deeply invested. There was a genuine sense of “all for one and one for all.” I think more of that should exist in the world – this collective energy and everybody trying to make something together. The show is many different things in one. I think some people might be excited about it and some people might be angered by it. I think all of that is good and I’m interested that it gets a conversation going. Dietland airs Mondays at 9/8c.